This fragrance was created by French Designer Martine Micallef with perfumers Geoffrey Nejamn and Je.. Composed by Jean Claude Astier and Geoffrey Nedjman in 2011. The striking matte black flacon, studd..
Geoffrey Nejman and his wife Martine Micallef founded Micallef Parfums in Grasse, Southern France in.. 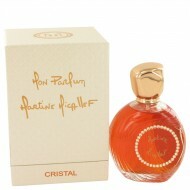 Introduced by M. Micallef in 2002, Micallef Le Parfum 21 is an exotic and fruity scent fit to be wor.. Pair Micallef Style with your best suit for a look that exudes brilliance and confidence. This bold .. This fragrance was created by French Designer Martine Micallef with perfumers Jean Claud Astier and .. Private Line Red Jewel for women was created by M. Micallef and was released in the 2000s. It is an .. This fragrance was created by the house of M. Micallef with perfumers Geoffrey Nejman and Jean Claud..